Now that looks like a awsome reel i want one. Can ya swap the handle over to the right side of them? Pump iron to drop iron! At that price wouldnt a Van Staal be the better go? I was just playing with a Van Staal. Click click reel. Different from the smooth Jap reels. It's like you can feel each gear lock together as you wind. I dont doubt that it is well built though, just different from the Jap reels. Oh forgot to mention - heavy. Very Bling in it's own way. i always thought van staals were cheaper around 900 bucks? Dogfight only has ONE purpose. GTs. maybe two.... tuna AND GTs. jig with it and people will give you shifty eyes.... a few fish in and you'll get it. well msotly anyway. yeh the van staals are around $1200- $1400 depending which model. FYI the large saltigas and stellas has upto 30kg of drag.....as quoted on their manufacturer's website but you and I know that its impossible to get 20kg, let alone 30!! And yes horses for courses.....this is a deep spool high speed reel. 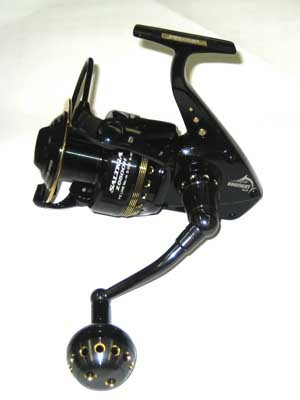 The 6500 Expedition is a deep spool low geared reel. Like wise the Stella 10000 and 20000. The Van Staals are all low geared reel and the Accurate Twinspin 30 is a high speed reel....at this stage. The Van Staal and Accurates are built American tough and you will feel the gears working. The Van Staal has a direct drive system so its more noticeable. The Japanese reels are all about smoothness with plenty of bearings to support all moving parts. Therfore you wont notice the gear meshing as much. All mentioned are top range reels and are the best that each company produces. And of coz, all comes with BLING!! I don't think the name has any reference to dogtooth tuna Nealez. The way I interpret it is the term 'dog fight' in the aviation sense which I think means to battle at close quarters... or something similar (you've all seen top gun :P ) I guess this is similar to the way you'd fight GT's. Afterall, it is the next high speed model up from the Saltiga GT. They look bluddy impressive! Custom rod with black and gold binding would make anyone cream i reacon.